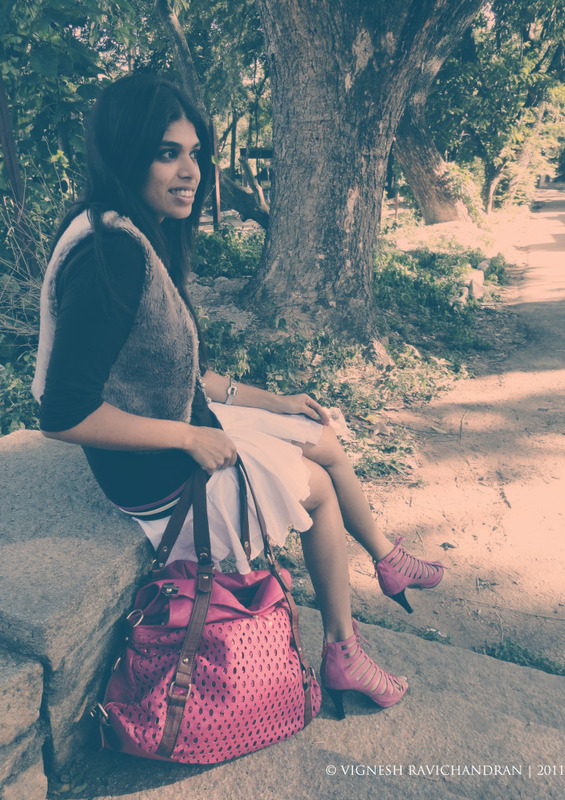 Stilettos Diary: A furry affair. Its time for Wardrobe Wednesday. Today's look is called as "A Furry Affair". This week's inspiration is the faux fur vest I bought recently. I picked up the vest from my favourite store Gold dust. Had a blast shooting for this look. I have overloaded this post with Vignesh's amazing work. I am just not able to decide which photos to put up. I love them all. 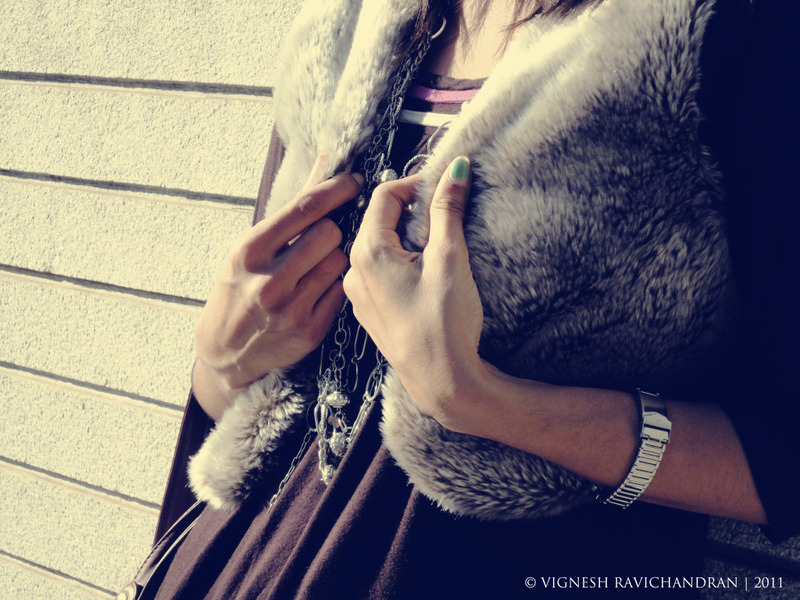 I picked up the faux fur vest for 200 Rs . The asymmetric pleated white cotton skirt gives a fun , flirty look to the outfit and the skirt is beautifully complimented by contrasting dark brown top with tailored detailing on the neck and waist. The pink La Belle bag is a perfect fold over. 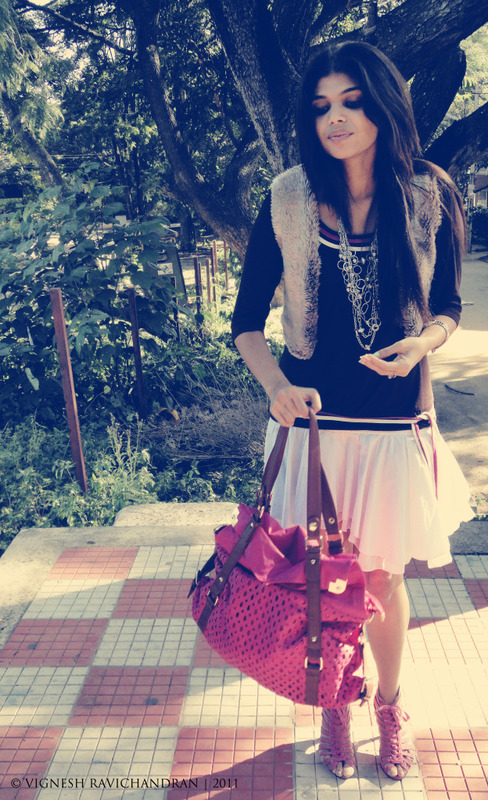 I have tried to create a color block using quintessential pink ,brown combination with the bright white skirt. 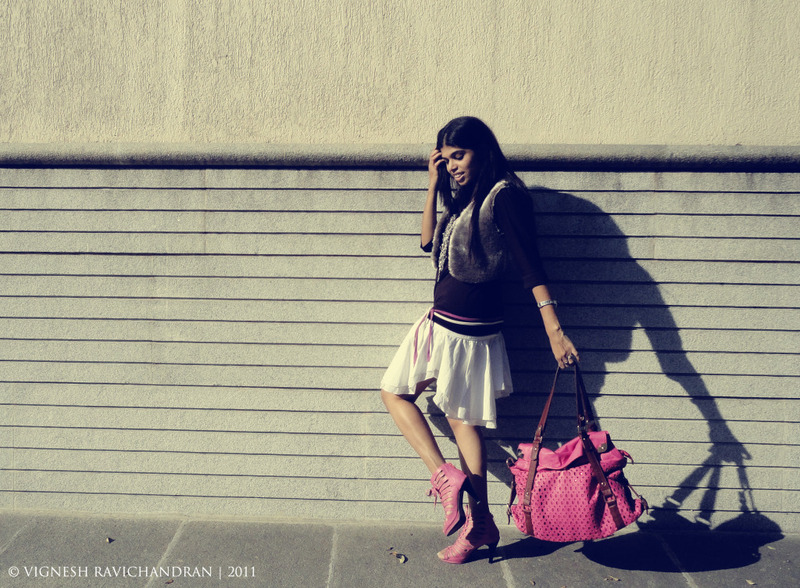 My pink gladiators (got during 70% sale from Luciano ) cost around 700 Rs. Always remember girls keep either your shoes and bag matching or belt and footwear matching. You can experiment with a maximum of three different colors. I completed the look by adding a metallic touch with my Aiva necklace (cost 250 Rs) and Fast-track Military collection (gift from my friends ). I read a quote recently, "a paragraph is like a skirt,it should be long enough to cover the subject but short enough to keep it interesting". Hopefully my short description of the look is good enough to keep it interesting. Please do give me valuable feedback how I can improve my blog , my writing and of course what you guys think about this look. Love the pics. The pics look very stylish and suitable for the blog. The font alone is looking very formal. A stylish font type would suit more. Great work megha! Nice pictures! Looking great! looking great!! !..few of the pics are really awesome....seems someone has picked up from a fashion mag. Great blog, we are definitely following! I must compliment the photographer - Vignesh! 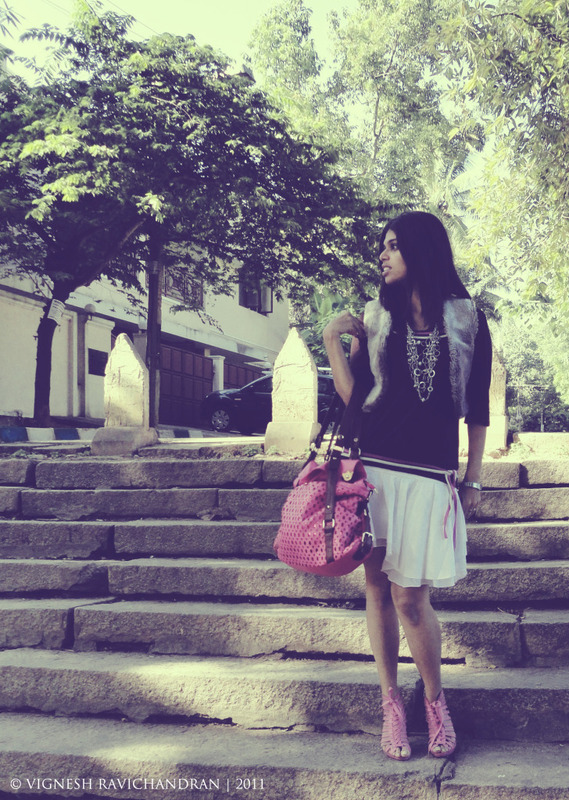 The fifth snap where the fur coat is flying with the wind is an awesome click! Great job Vignesh.. you really have made Megha look tremendously good..and Megha - great taste! great name! Black , White and Metallic me.